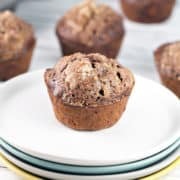 Extra moist with a crackly top and packed full of zucchini, these streusel topped chocolate zucchini muffins are the most delicious way to eat your veggies! It’s the end of summer. Your zucchini is piling up. It just keeps coming in your CSA box, or growing to epic sizes in your garden. 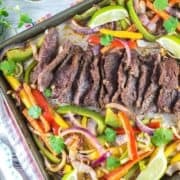 You’re sick of eating for dinner. What on earth are you supposed to do with all that excess zucchini? 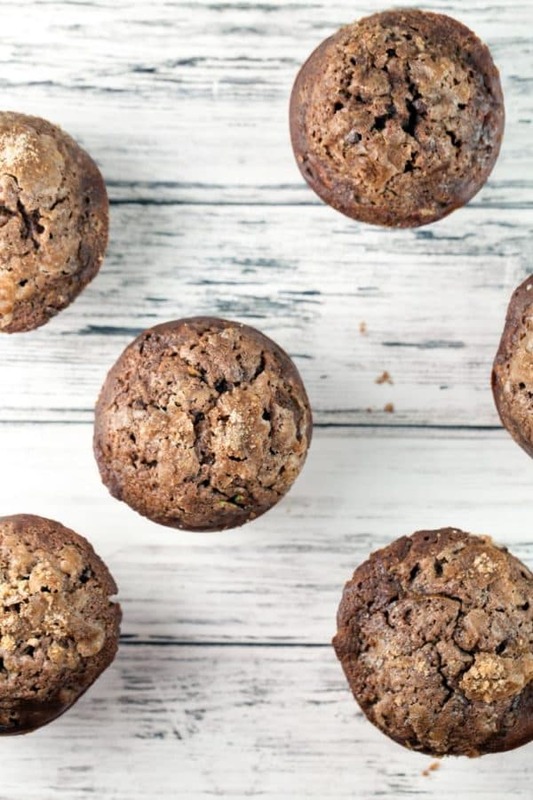 Streusel topped chocolate zucchini muffins, that’s what. Pretty much the best way to eat your veggies, amirite? I mean, just LOOK at that huge pile of zucchini in there. ↓↓↓ Chocolate schmocolate. This is basically a health food! ? 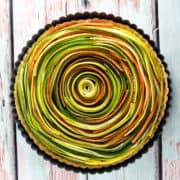 If you’re NOT tired of zucchini for dinner, allow me to suggest the following delicious options: this beautiful spiral vegetable tart, the most popular recipe on Bunsen Burner Bakery. Or maybe a tomato and zucchini galette? 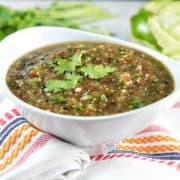 How about this easy, spicy, one skillet Mexican zucchini? No? Not into more zucchini for dinner? 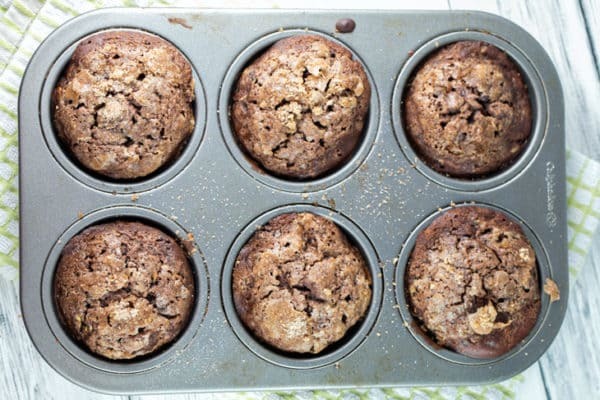 Then read on for extra moist, extra chocolately muffins… with a big heaping pile of zucchini. This recipe is actually a slight update on my chocolate zucchini bread recipe from 3 years ago. I bring a lot of what I bake into work with me, and muffins are so much easier than bread. (No cutting! No wrapping a loaf in foil! Toss in a bag and walk out the door!). 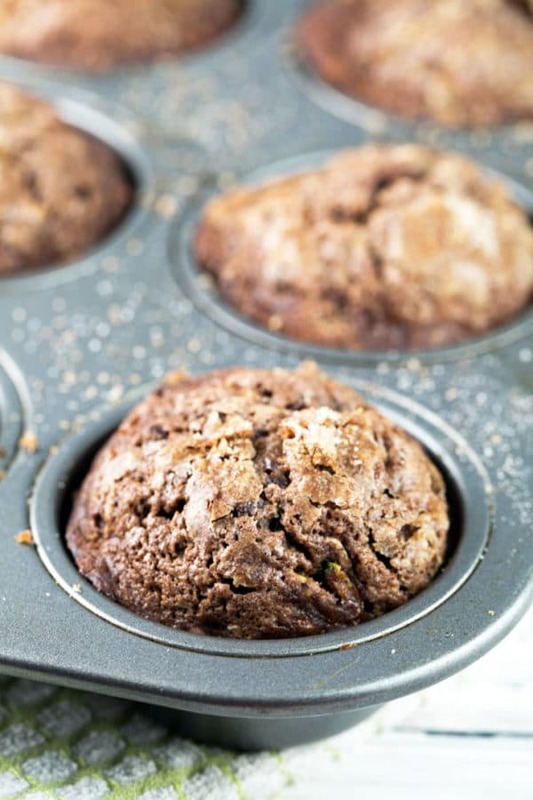 There are a million zucchini bread and muffin recipes out there? What makes this the one you want to try? Well first off, it’s basically a double chocolate zucchini muffin: chocolate muffin + chocolate chips. And then it’s covered in a cinnamony, sugary, crispy, crunchy streusel. It’s also a one bowl, whisk by hand type muffin. Easy peasy. 10 minutes, from getting ingredients out to in the oven. And who doesn’t like fast, easy, and minimal dishes? 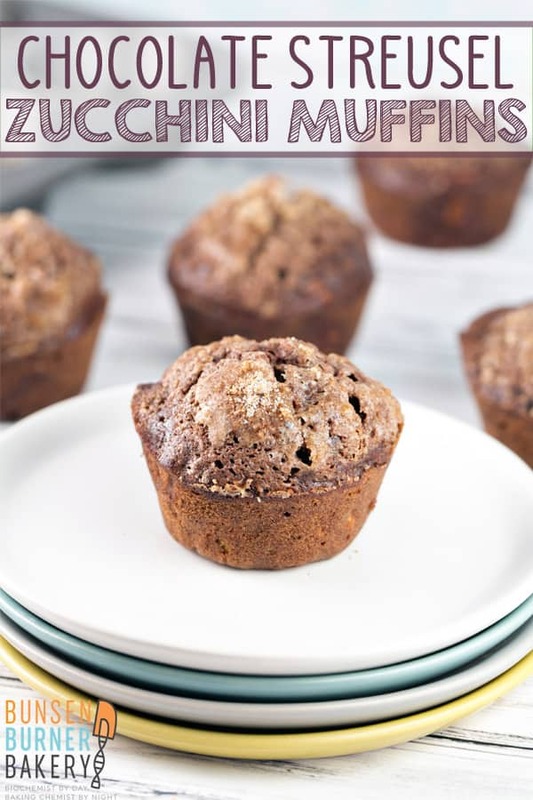 The zucchini keeps these muffins extra moist, and the crackly streusel topping is the perfect contrast. It’s just so good! And even better, these freeze well. So use your giant zucchini stash to make a double batch and toss some in the freezer for later. Or bring them into work and share with your coworkers. I assure you from personal experience, your coworkers will be very happy. Preheat the oven to 425 °F. Grease a 12-well muffin tin or line with muffin liners. Using a whisk, stir together 1/2 cup granulated sugar, 1/4 cup brown sugar, oil, and eggs until well combined. Add the yogurt and vanilla, stirring until combined. 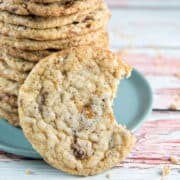 Add the flour, 1 tablespoon cinnamon, baking soda, salt, and cocoa powder to the wet ingredients and stir until just combined. 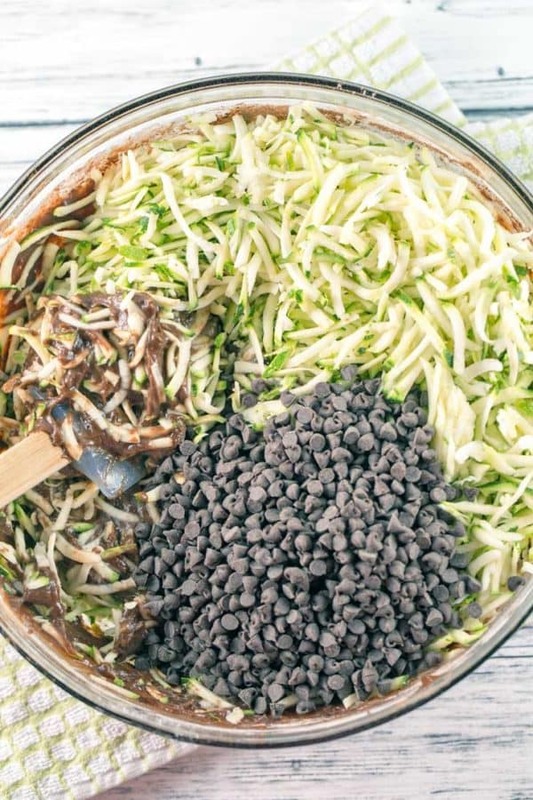 Fold in the chocolate chips and zucchini. Divide the batter equally among the 12 wells of the muffin tin. Sprinkle the remaining cinnamon, sugar, and brown sugar topping over the batter. Bake at 425 ° for 5 minutes. Keep the muffins in the oven and reduce the temperature to 350 °F. Bake for an additional 14-16 minutes, or until a tester inserted into the center of the muffins comes out clean. Cool for 5 minutes in the pan, then remove to a wire rack to cool completely. 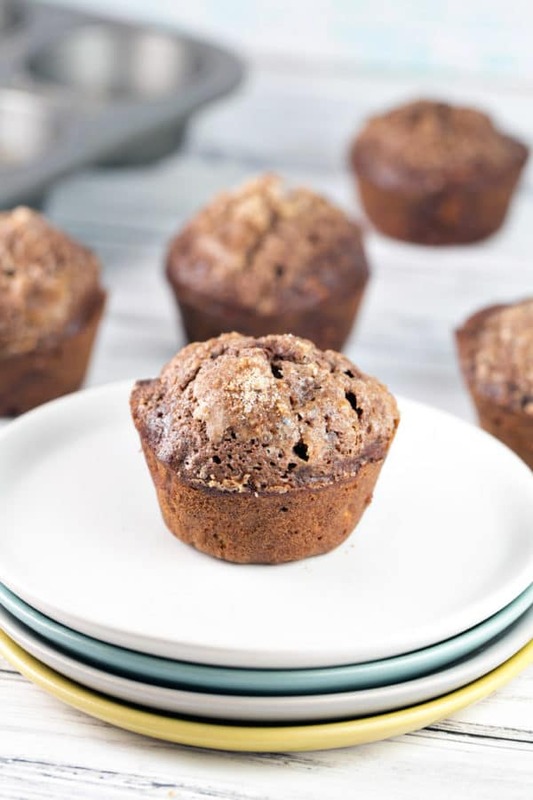 To freeze muffins, place fully cooled muffins in a plastic freezer bag and store for up to 3 months. 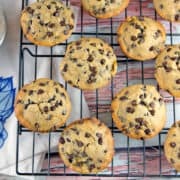 To thaw, remove muffins from freezer and store at room temperature. Rediculously good!! Made one batch…and ended up keeping the oven hot and making a second batch with the extra zucchini to put straight in the freezer. 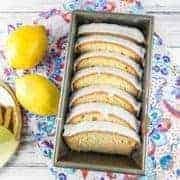 I usually use half whole wheat and half all purpose flour, and they were still amazing and it wasn’t even noticeable. The techniques of the high oven for the first five is genius…I will be trying that with a little sprinkle of sugar on all future muffin recipes. 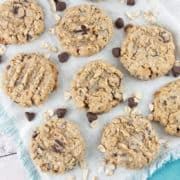 Ran out of chocolate chips (used scant 1/4 cup) for the second recipe and I almost liked them more because the balance of flavors…either way, they are amazing! Yay! So glad you like them! The quick bread version I make of the same recipe is half whole wheat and half regular flour and I agree — it comes out so well and the dark chocolate flavor plus the extra moisture from the zucchini perfectly masks the drier whole wheat flour. Definitely do the higher starting temperature for all your muffins, it helps get a little extra rise and that deliciously crispy top! Wow! 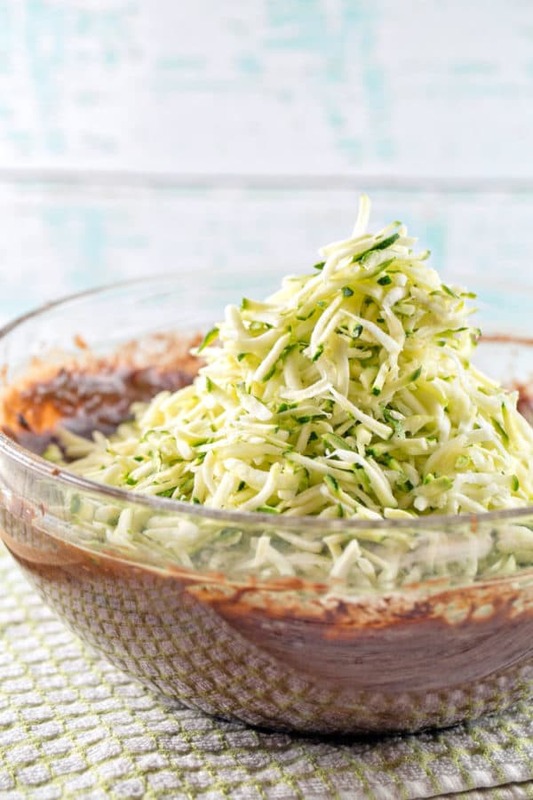 I can’t believe how much zucchini you managed to pack into these little chocolate beauties. Such a tasty way to consume so many healthy veggies. 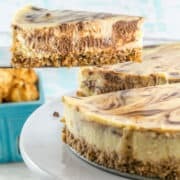 I’m also loving that sweet brown sugar topping too.